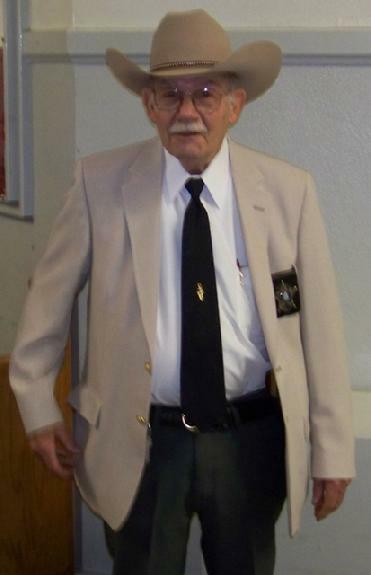 "IT'S BEEN FUN"...Miller Moffett Calls it a Career, LIVINGSTON, February 29, 2008 - Longtime Courthouse bailiff and peace officer Miller Moffett retires. Moffett was born in Goodrich and raised in Polk County and served in the Marines in World War II (South Pacific and North China). After the Marines, Moffett went to college at night and worked during the day. Other careers for Moffett included an 8 year stint as a design draftsman, and a 16 year career working in the oil field supply business. Moffett has worked as a courtroom bailiff for Polk County for the last 16 years. Moffett could often be found drawing pictures on styrofoam coffee cups while court was in recess. "I've had lots of memorable moments as a bailiff, but you just never knew what was going to happen when court was in session".